The latest line of attack against HIV targets its viral casing (or capsid). 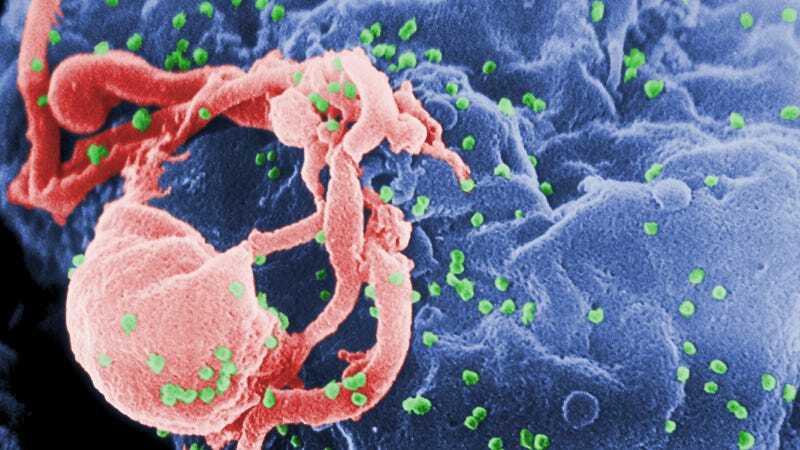 Capsids lie between the virus's spherical outer coat, a .1 micron diameter, lipid-based layer known as the viral envelope, and a bullet-shaped inner coat known as the viral core that contains the strands of HIV RNA. Capsids comprise 2,000 copies of the viral protein, p24, arranged in a lattice structure (a rough insight gleaned only from years of cryo-electron microscopy, nuclear magnetic resonance spectroscopy, cryo-EM tomography, and X-ray crystallography work). The capsid is responsible for protecting the RNA load, disabling the host's immune system, and delivering the RNA into new cells. In other words: It's the evil mastermind. But until very recently, the precise structure—how the thousands of copies of p24 actually meshed together—remained a mystery. The capsid's (relatively) large size, non-symmetric shape, protein structure has stumped researchers' attempts to effectively model it. Earlier research had revealed that the p24 arranged itself in either a pentagon or hexagon shape as part of the capsid structure, but how many of each and how the pieces fit together remained out of reach because science simply didn't have the computational prowess to model this incredibly complex subatomic structure in atomic-level detail. The team developed a novel shaping algorithm for the project, dubbed molecular dynamic flexible fitting. "You basically simulate the physical characteristics and behavior of large biological molecules, but you also incorporate the data into the simulation so that the model actually drives itself toward agreement with the data," said Professor Klaus Schulten of the University of Illinois in a press release. "This is a big structure, one of the biggest structures ever solved," Schulten continued. "It was very clear that it would require a huge amount of simulation — the largest simulation ever published — involving 64 million atoms." In all, the HIV capsid requires 216 protein hexagons and 12 protein pentagons to operate—arranged exactly as the predictive models said they would be. The new discovery reveals a stunningly versatile protein in p24. The protein itself is identical whether it's shaped into a pentagon or a hexagon, only the attachment sites between p24 proteins varies between shapes. How that works remains a mystery. "How can a single type of protein form something as varied as this thing? The protein has to be inherently flexible," said Schulten. New questions aside, this breakthrough illustrates precisely how the capsid works and how scientists can best attack that function to disrupt the virus' ability to replicate. By exploiting the capsid's structure, researchers theoretically could deliver a molecular padlock that prevents the viral core from opening and the virus from spreading. This discovery could lead to an entirely new suite of treatment alternatives and could finally outpace HIV's ability to rapidly evolve resistance to current enzyme-based medications. "The big problem with HIV is that it evolves so quickly that any drug you use you get drug resistance which is why we use a multi-drug cocktail," Professor Simon Lovell, a structural biologist at the University of Manchester, said. "This is another target, another thing we can go after to develop a new class of drugs to work alongside the existing class."